Learning 3D animation can be a daunting prospect. I know because I did it not that long ago. So I created a course that is a great introduction to 3D and Autodesk Maya and structured in a format that’s my favorite: project-based learning. I hate classes that bore me to death with listing off every single tool or menu item one after the other. I just want to learn how to make things and through making things I’ll pick up the program if I do it enough and in the meantime I’ll be making useful things! 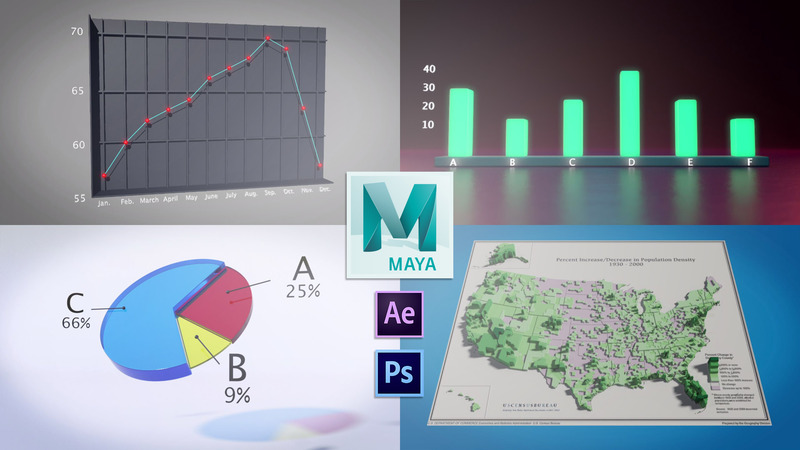 I wanted to cover the most used data visualization categories so for anyone who has to make reports and give presentations this course will take your work to the next level! You’ll be able to make 3D renders of your data to use as still images in reports or animations in your presentations. If you’re interested in starting to learn 3D this will be a good place to start. In every studio I’ve worked at they have used Autodesk Maya, it is the industry standard for 3D animation. Thanks for checking out the course! You can access it on Skillshare or on Udemy. Skillshare is cool because you get access to every course on the site for one monthly price.